Our recent search for quotes from across the market on behalf of an invoice discounting client has also identified differences between the funding approaches of different invoice discounting companies. 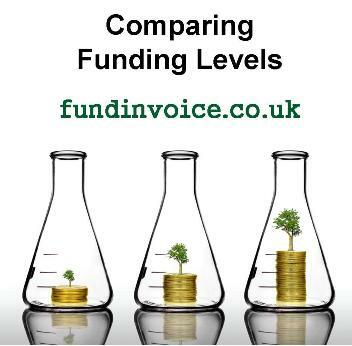 Based on the quotes provided for a client, we set out to compare the funding levels offered by different invoice discounting companies that we spoke to. The two areas of comparison that we focused on were the "prepayment percentage" and the "facility limit". You might expect that these would be similar for an average client but there were variations across the field. We found that almost a third of the invoice discounting companies were prepared to quote 90% prepayment against invoices, whilst the remaining majority quoted 85%. It could be a crucial difference when a business needs to access the maximum amount of funding possible. For example, taking an average sales ledger of £100,000 of outstanding, unpaid sales invoices, an 85% prepayment could yield up to £85,000 of funding (ignoring any other restrictions or reserves). A 90% prepayment level could release up to £90,000 i.e. an additional £5,000 of funding - approximately 6% more than the lower funding level. An additional £5K might be very useful additional working capital. It is then also the case that a higher prepayment percentage (sometimes called an early payment percentage, or funding level) will continue to unlock additional funds, as and when new invoices are raised. Once again, a £5K invoice funded at 85% would release £4,250 rather than £4,500 at 90%. The facility limit is less of an issue for companies as discounters will tend to increase them if required. It serves as a maximum cap on the level of funding allowed. Often they are only implemented in order to ensure that funding levels don't increase significantly without the opportunity to review the facility. However, sometimes reviewing a limit can attract a fee and the level that it is set at could be an indicator as to how flexible a funder might be prepared to be. In our example, based on the anticipated "funds in use", the amount that they customer expected to borrow at any time, the highest facility limit offered was approximately 1.7 times the level of funds in use (offered by almost a quarter of the funders that we spoke to). Whilst the lowest limit offered was just 1.14 times the level of funds in use. It could be argued that this would offer little room for growth and might result in the company needing to renegotiate soon after commencement. Once again we are able to use this kind of research in order to help clients understand the differences in funding levels, between providers.